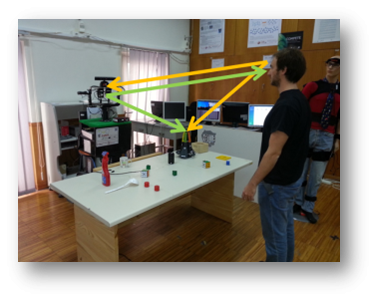 Current research in cognitive systems for social robots has suggested that automatic attention mechanisms are essential to social interaction. In fact, we hypothesise that enabling artificial cognitive systems with middleware implementing these mechanisms will empower robots to perform adaptively and with a higher degree of autonomy in complex and social environments. However, this type of assumption is yet to be convincingly and systematically put to the test. For this purpose, an overarching framework implementing artificial attention is presented, designed to fulfil the requirements of social interaction (i.e., reciprocity, and awareness), with strong inspiration on current theories in functional neuroscience. The ultimate goal will be to test our working hypothesis and demonstrate the importance of the role of attention in adaptive, social robotics.